Dreamhack Mumbai tickets are now on sale. Vistor passes start at ₹499! DreamHack Mumbai is all set to take place in roughly two months, and information about ticket pricing and availability for the ‘world's largest digital festival’ has just been released. 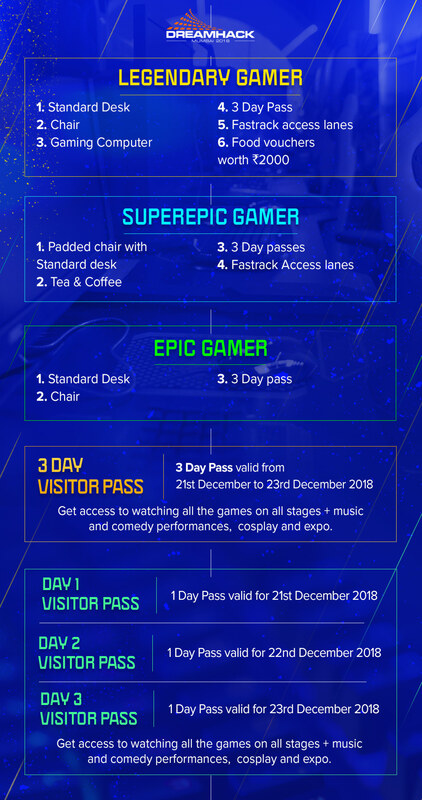 Prospective attendees can now purchase their tickets, on BookMyShow, to attend India’s first ever DreamHack, which will be held in NESCO, Goregaon, Mumbai on December 21 to 23. There are multiple ticket categories and prices for Visitors and Bring Your Own Computer (BYOC) Gamers. For Visitors, there are two options for tickets. For BYOC Gamers, All tickets will give you passes for all three days. There are three different categories or zones in different sections of the stadium. There is NO sleeping area, in the event. IRL Streaming Policy: IRL streaming is allowed and encouraged at DreamHack, however, it’s important to be respectful of our visitors! If you are IRL streaming, should a visitor ask you to not film or otherwise feature them in your IRL stream you are obligated to cease filming them immediately if you wish to follow our rules. If you are IRL streaming and found to not be following this policy you will be asked to leave the event. DreamHack India is all set to feature a LAN party, gaming competitions, a BYOC, a cosplay championship, panels, non-gaming activities including scavenger hunts, tabletop games, expos, music concert, art and more over the course of the 3 day weekend. The event will also play host to The DreamHack India Invitational, where international teams are expected to attend. The total prize pool for esports at DreamHack Mumbai is ~USD 137,700 / INR 10,000,000 (Rupees 1 Crore or 10 million). Indian Gaming fans unable to attend the live event will be able to watch live streaming coverage of each day’s events on Voot. DreamHack Mumbai is being organised by NODWIN Gaming and Viacom 18. NODWIN Gaming is a client of and an investor in AFK Gaming Pvt. Ltd.